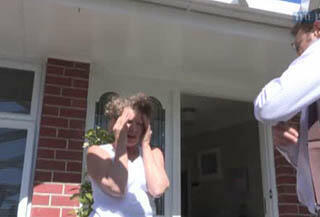 A video of Dallington resident Christine Mathieson being told that her orange-zoned property has been rezoned as green. The rezoning was confirmed earlier in the day by Canterbury Earthquake Recovery Minister Gerry Brownlee, who announced that 400 earthquake-damaged properties in Christchurch will be bought by the government. Mathieson's house is not one of them.